Supply response to lower crop prices is getting us nowhere. The theory—and one of the assumptions behind the 1996 Farm Bill— is that a drop in major crop prices will cause producers to do two things: plant fewer acres and cut back on input-use per acre. With less acreage and lower yields, output is curtailed and prices recover. Sounds logical. Let’s look at the data. Let us begin with the question, “How have farmers responded to lower crop prices with their planters?” According to USDA’s latest acreage report, planted acres are up for each of the four major crops—corn, soybeans, wheat and cotton. Corn planted acreage is projected to increase 2.8%, soybeans 1%, wheat 0.2% and cotton 4.6%. Planted acreage for the four crops totals 3.68 million acres more than last year’s 228.87 million acres. This 1.6% increase in planted acreage is occurring even though prices of the four crops have declined substantially. The season average price for each of the crops has declined each year since 1996 reaching 35 to 42 percent below the 1996 levels in 2000. 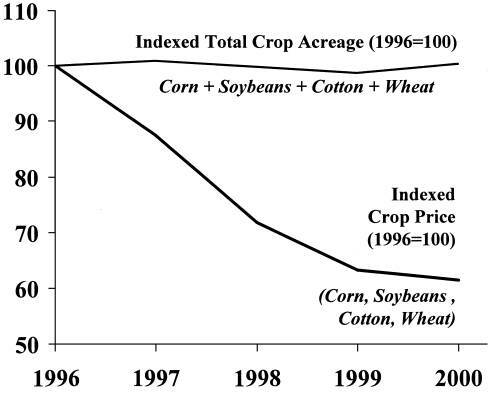 When aggregate price and acreage indices of the four crops are plotted as a graph (Figure 1) the data is striking. The graph shows that even though an index of the season average prices for the four major crops has declined by 39 percent, total acreage for the same crops has remained virtually unchanged—actually increasing by about 1 million acres from 1996 to 2000. One cannot simply conclude from these data that the total of major crop acreages does not respond to price. It probably does. No doubt there are acres somewhere out there that are not in production today because of the drop in crop prices over the years. But what we can say with certainty is that farmers change total crop acreage very, very little in response to general reductions in crop prices. It is also true that general weather conditions, soil conditions at planting time and other factors overwhelm the influence of price in determining how many total acres are planted. What about yields? Two economic factors should/could be at work to reduce yields this year. The first is the one mentioned earlier—farmers could reduce the use of fertilizer or other inputs in response to lower crop prices and therefore reduce yields. Another yield reducing factor for say, corn and cotton, could be from planting additional acres of less productive, lower yielding land. Let’s look at the data. Crop year 2000 yields for corn, cotton, and soybeans are expected to significantly exceed last year’s yields according to USDA’s World Agricultural Supply and Demand Estimates issued July 12th. Soybean’s projected 2000 yield is 40 bushels per acre compared with 37 in 1999; corn 137 and 134 respectively; and cotton 635 pounds per acre compared with 607 in 1999. Wheat yield is expected to be down by 1.5 bushels per acre in 2000 compared to 1999. Not surprisingly, weather is all-important in determining yields. Everything else, including crop prices, is secondary. Weather conditions this year allowed early planting of corn and soybeans in many areas of the country. It also allowed crops to be planted, period, in the Dakotas and other areas. But, of course, it’s weather during the growing season that counts the most. I visited relatives in central Iowa after the 4th of July. I cannot remember seeing better-looking corn in the 40 something years that I have paid attention to such things. Remember that ‘remember’ is a key word here. Despite seriously dry conditions in May, fields are, at the present time, dark green and even, no drown outs, and pollination conditions are ideal. From what I can understand, corn and, for the most part soybeans, are doing nearly as well over most parts of the Midwest, except that drown-outs are at usual or above average levels in many areas. If that is true, even though there are dry areas in our part of the country, we could easily see our first post-140 bushel per acre national corn yield. One thing is for sure—supply response to lower crop prices is getting us nowhere. We will return to our discussion on grain exports next week.